Thomas Bach will make his first visit to Tokyo since their selection as 2020 Olympics host on November 20. He will make the trip with Tokyo 2020 Coordination Commission chairman John Coates. The two will hold a press conference that day, and also attend a reception with Japanese business, government and sport leaders. 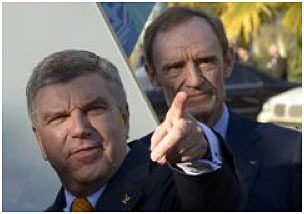 It will be the first visit to Tokyo since the two men assumed their new roles within the IOC. Joining the two will be an all-star cast from the IOC, with numerous key officials journeying to Tokyo. Some of the key officials include: Christophe de Kepper, IOC Director General; Pere Miro, the IOC’s National Olympic Committee relations director and Timo Lumme, Managing Director of IOC Television and Marketing Services SA. In Tokyo this week is Gilbert Felli, the IOC’s executive director for the Olympic Games and Christophe Dubi, IOC sports director. They are part of the IOC’s technical team that will meet with Tokyo 2020 officials November 14 and 15. Felli is also expected to attend the meetings with Bach and Coates.